The JO-Zero was modeled after robots appearing in Manga. It retails for about $1300. In this uncertain economy, it’s important to find the right opportunity to securely invest your money. This story is not about one of those opportunities, it’s about a toy robot. A really awesome programmable toy robot that will only set you back ¥120,000 or about $1300. That’s right, why invest in gold or bonds when you can have one of the most kickass robotic buddies out there. The JO-Zero, developed by Robo-One champion Motohira Nakamura, has twenty degrees of freedom, letting it move in ways other such robots can’t. 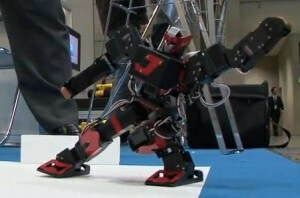 The JO-Zero debuted at IREX 2009 and Dig Info has a great video of its performance. Don’t miss it writing its name at 1:18, or limboing in a rescue simulation at 2:00! Nakamura is famous for his transformer bot that has been viewed millions of times on YouTube (see below). He designed JO-Zero to look as awesome, and with its own impressive physical flexibility. There are eight degrees of freedom in the arms, 10 in the legs, and 2 in the waist. More importantly though, JO-Zero can be programmed very easily. Included in its price tag is software with a library of motions that builders can customize by setting the parameters. That’s going to make the JO-Zero a favorite for those amateur roboticists who want to create new routines and fight moves easily. The bot weights less than 1 kilo, making it perfect for small robot wrestling contests. As far as robot kits go, $1300 isn’t actually a huge figure. Kondo’s specialized articulated model robot hands retail for $650 all on their own. Of course, most of us may not want to drop that much cash on a robot, no matter how cool it is. For us, Nakamura has a version at the marginally more reasonable price of ¥ 100,000 ($1100). The name of that bot: the STD-Zero. Um…I think this is one of those translation glitches that happens from time to time between Japanese and English. That, or Nakamura is trying to break into a new market.